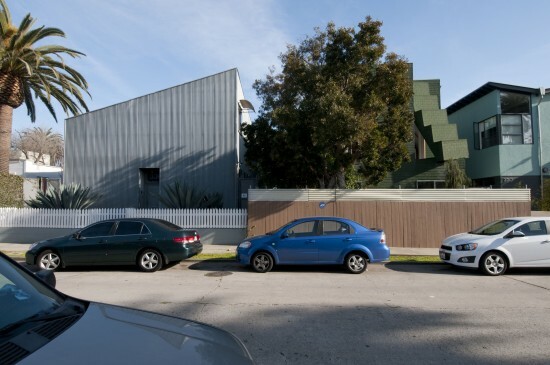 The AIA Los Angeles has awarded its 2013 Gold Medal to Frederick Fisher. 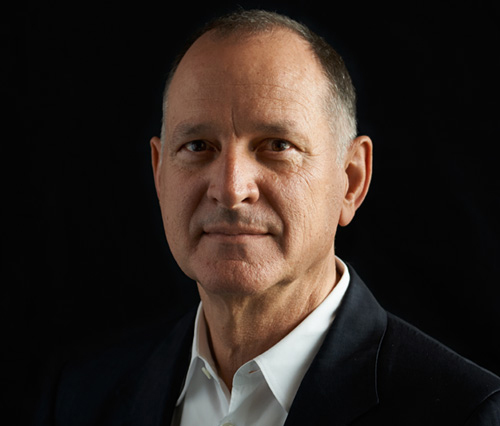 Founder and principal at Frederick Fisher & Partner Architects, Fisher has been practicing architecture in LA for more than 30 years. During the late 1970s he was part of the “L.A. School,” a group of architects including Thom Mayne, Frank Gehry, and Eric Owen Moss who staged exhibitions at Mayne’s in-home architecture gallery.Fisher worked in Gehry’s practice for several years, yet in his own designs Fisher eschews the mind-bending geometry for which Gehry and some of his other contemporaries are known. Instead, Fisher’s work is characterized by a combination of lightness and restraint. Many of Fisher's projects have been art museums or educational buildings. 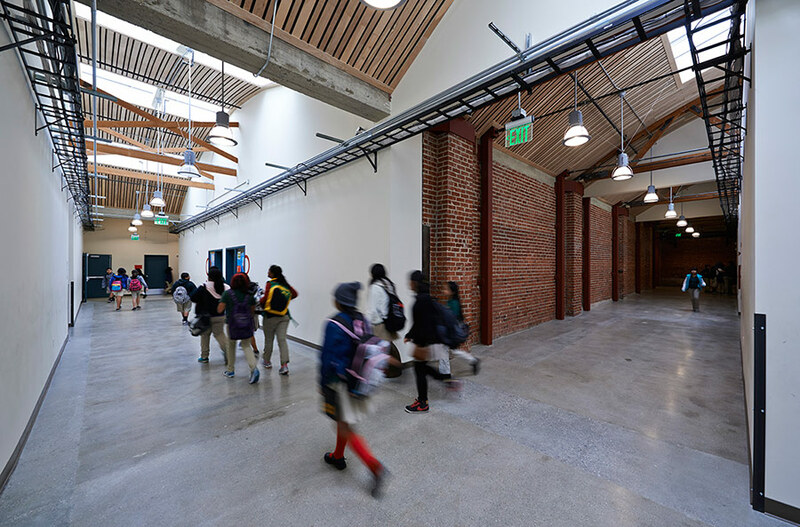 Adaptive-reuse cultural projects include the P.S.1 Contemporary Art Center in New York, the renovation of A. Quincy Jones’s The Barn, now the home of the Chora Council of Metabolic Studio, and the Sturt Haaga Gallery of Art at Descanso Gardens. 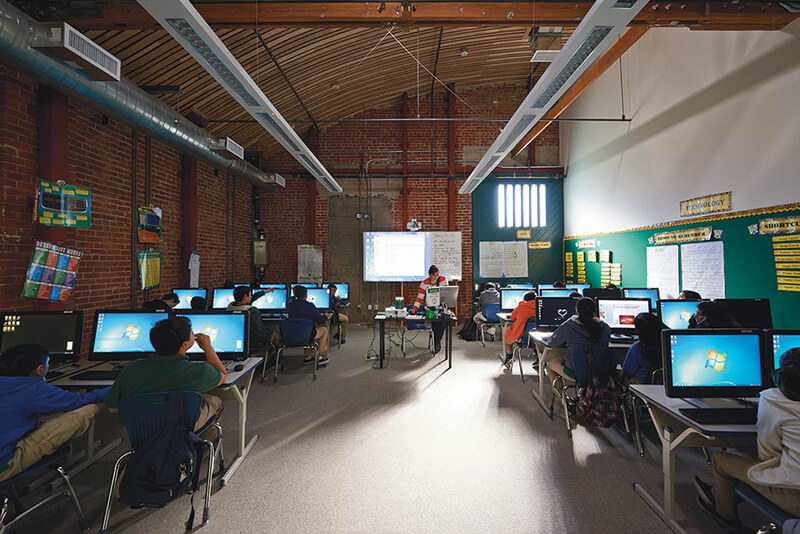 Among Fisher's work for educational institutions are the Jane B. Eisner Middle School, housed in a building originally owned by the Southern California Telephone Company, and the Walter and Leonore Annenberg Center for Information Science and Technology at Caltech. 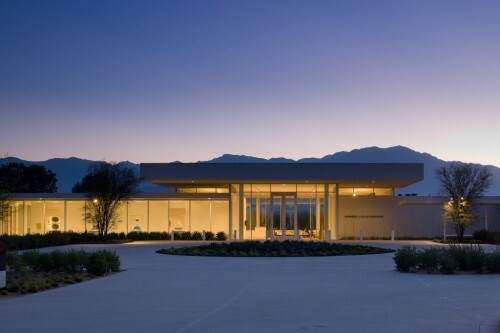 Fisher also designed the Sunnylands Center and Gardens at the Annenberg Retreat at Sunnylands and the Annenberg Community Beach House in Santa Monica. Fisher will receive his award at the AIA Los Angeles Design Awards Gala on October 28th. Other presidential award winners include LA mayor Eric Garcetti, LACMA director Michael Govan, and artist James Turrell. 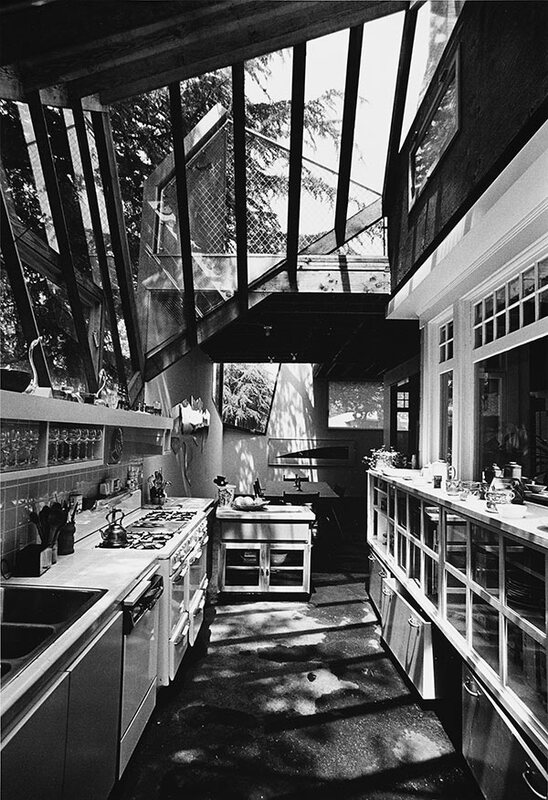 Neil Denari's Alan-Voo House in Los Angeles. The southern California architecture scene just received a well-deserved slap in the face from local critic Christopher Hawthorne. In a recent Los Angeles Times review of A New Sculpturalism, at the city’s Museum of Contemporary Art, Hawthorne labeled the exhibition the product of “an architectural ruling class in Los Angeles that is not so much dysfunctional as increasingly insular.” The city, which considers itself a leader, or the leader of American architectural experimentation and creativity, may see Hawthorne’s review as simply a criticism of a failed exhibition. But it is more accurately a condemnation of a scene that is top heavy with a few design stars, a local educational model that promotes the notion of individual genius, and a culture that celebrates formal innovation over civic engagement. A review of this “confused” exhibit is hardly the most important criticism that Hawthorne is leveling here. Rather, he is bravely taking on the leaders of the city’s architectural establishment. He writes that Frank Gehry, Thom Mayne, and Eric Owen Moss who though they are “influenced deeply by the antiwar politics of the 1960s and the counterculture, having cast themselves for so long as rebels and outsiders,” are behaving “as though they are still underdogs, still marginalized and misunderstood.” It may seem odd that this city, which prides itself on a lack of tradition, has evolved an architectural culture that is un-generously strangling its younger generation of architects. Hawthorne—who represents a newer voice in the California city—is supporting this younger generation who must sometimes feel overwhelmed by the legacy of the older generation, who are still winning competitions and getting big commissions. It is true that southern California is a center of a uniquely creative architecture—even New York’s own Ada Louise Huxtable admitted as much in her writings. New York has benefited in recent years from thrilling new structures by Neil Denari, Morphosis, Frederick Fisher, and Frank Gehry. But so much of Los Angeles public discourse and debate has the ring of Chamber of Commerce self-promotion (How many more exhibits and lectures can it produce on Austrian emigrant architects in L.A.?) and breast beating about what a great culture it has created. In fact, the rest of the country needs L.A.’s creative design spirit and lack of traditional tropes. It would be a shame if its design community does not take Hawthorne’s remarks to heart and reinvigorate its culture—much in the way it seems able to constantly spin out inspiring new architectural forms. The ability to regenerate is in LA’s architectural DNA. 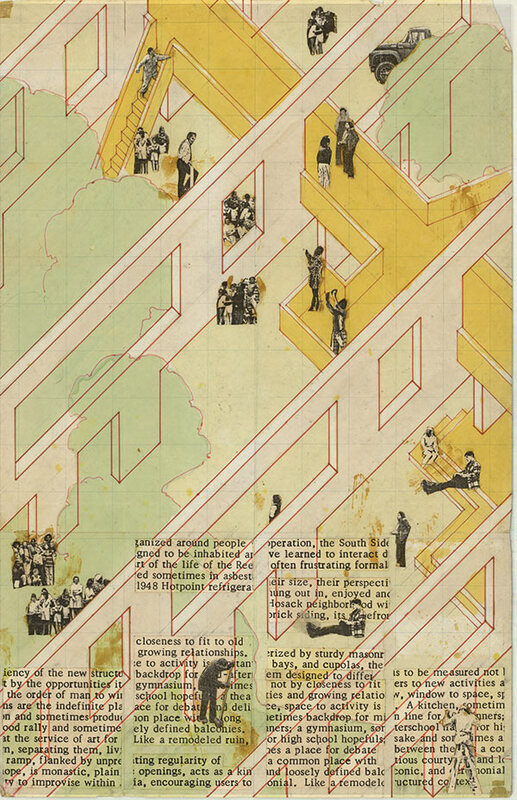 It happened in the 1920s, in the 50s, and then again in the 70s—the subject of A Confederacy of Heretics at SCI-Arc, part of the Getty’s Pacific Standard Time Presents series. Curated by Todd Gannon, Ewan Branda, and Andrew Zago, it focuses on a group of young architects in the 70s and 80s, including Craig Hodgetts, Robert Mangurian, Thom Mayne, Michael Rotondi, Coy Howard, Frederick Fisher, Eugene Kupper, Eric Owen Moss, Peter de Bretteville, Frank Dimster, Frank Gehry, and Roland Coate, Jr. 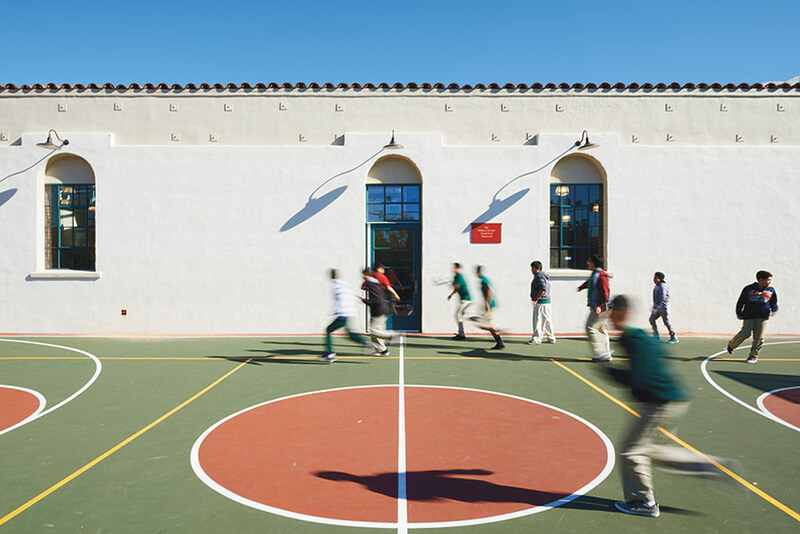 This group is still making a mark on international architecture through buildings and teaching. Confederacy of Heretics invites us to observe the spirit of fresh exploration and rebellion that gave their ideas birth. The 1960s and 70s demanded renewal. In the era of Nixon, there was plenty to rebel against. Mainstream modernism was stagnant. These “heretics” (the word traces back to the Greek word for “choice”) chose to strike out in many new directions. Left to right: Gehry Residence, 1978, Frank O. Gehry; Daniel Studio, 1980, Coy Howard; Five Condominiums, 1981, Eric Owen Moss. Where Modernism was highly polished, several of them picked and chose from the visual richness of LA’s commercial, industrial, and construction industry vernaculars, especially those seen in Venice (then still funky), where many had their offices—see Mayne and Rotondi’s messy Sedlak house. Where mainline modernism considered history taboo, some of these rebels helped themselves to traditional architectural forms. Where establishment modernism was intensely serious, these architects embraced the new age of pop, of Ruscha, Moses, and Oldenburg, of Venturi, Scott Brown, and Izenour, who awakened us to what was out there on the streets. For all their rebellion, it was also the ongoing themes of LA architecture that drew them: the freedom to explore unconventional ideas, and the irresistible provocation of advancing technology. 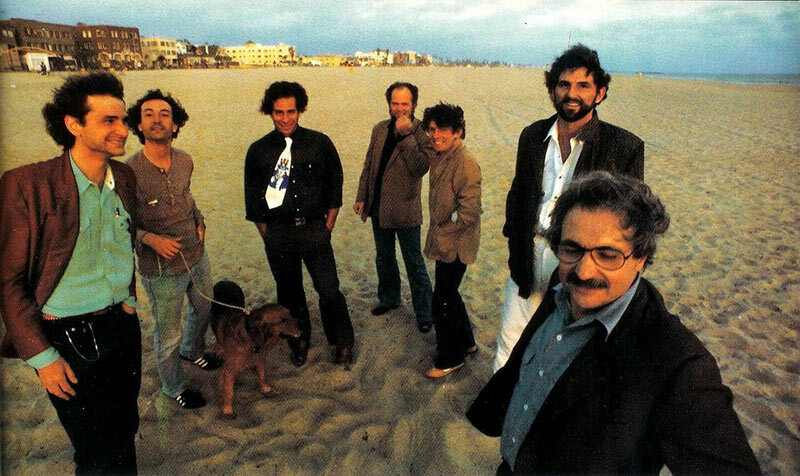 Seven of the architects who participated in the Architecture Gallery, from left to right: Frederick Fisher, Robert Mangurian, Eric Owen Moss, Coy Howard, Craig Hodgetts, Thom Mayne, and Frank Gehry at Venice Beach, 1980. 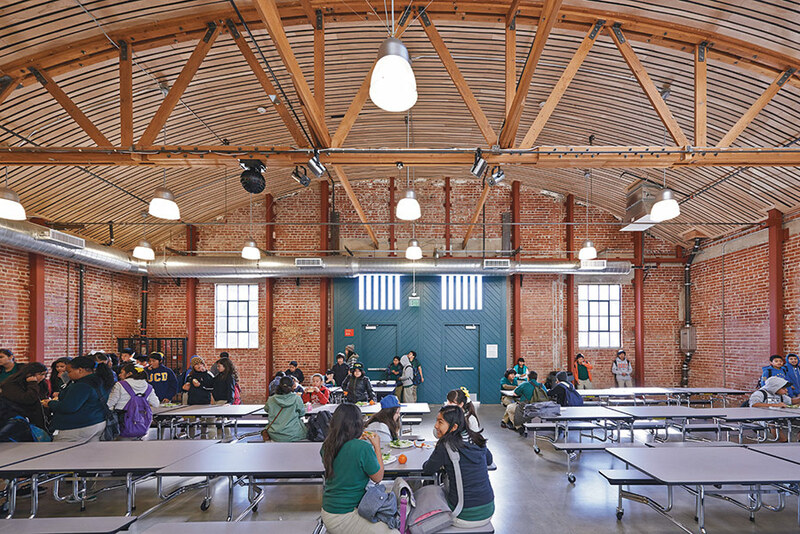 Confederacy of Heretics shows us how these ideas energized this group of architects. The Alexander house by Roland Coate, Jr. draws from the sweeping forms of freeway engineering. Peter de Bretteville and Michael Rotondi’s Ajax Car Rental agency, a gem of FotoMat-like architecture, tunes up the big, bold graphic signs of the LA commercial strip. 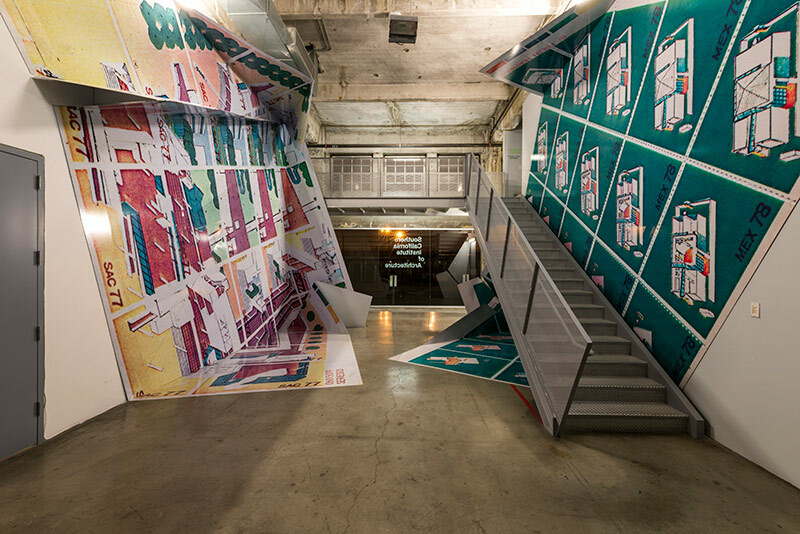 The pop/tech drawings of Craig Hodgetts and Robert Mangurian’s Southside Settlement house are annotated, grafittied, and ennobled with imprints of comic books, Jack in the Box wrappers, Fiorucci glam, toys, robots, and a sleek adding machine as handsomely crafted as anything recovered from King Tut’s tomb. 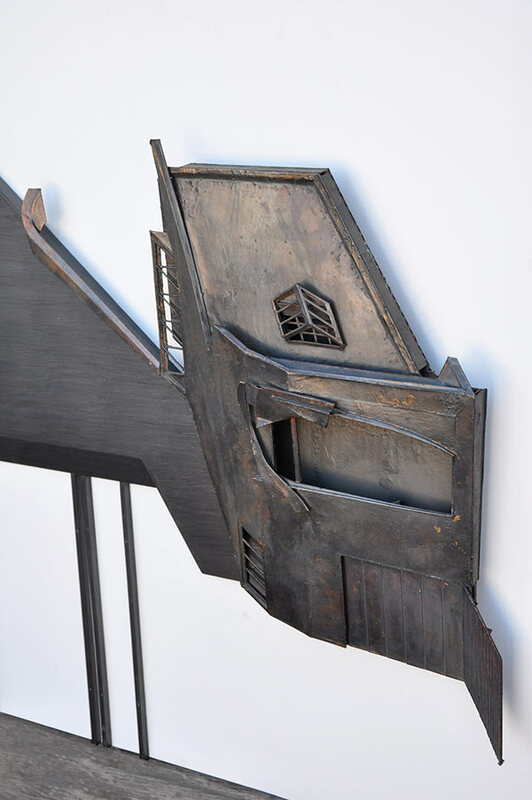 Just as this exhibit reveals the birth of deconstructivism (see Frank Gehry’s house), it also shows a rebellious interest in the history of architecture, which came to be labeled, then derided, as postmodernism. 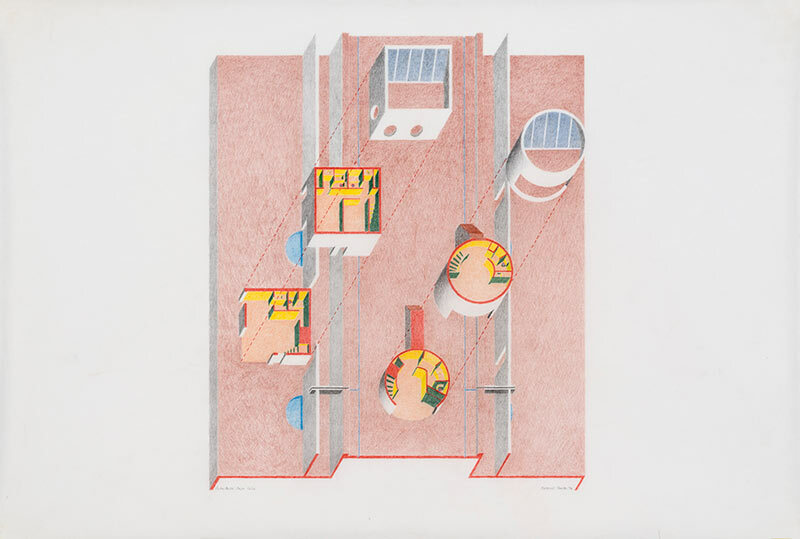 The classical symmetry and forms in Fred Fisher’s rock star drawing of a solar crematory were taboo in the world of late modernism. So is the Piranesian plan and presentation of Studio Works’ “The River and The City” model. These days, the show’s gorgeous hand-drawn Prismacolor drawings may seem closer to the fine craftsmanship of Marion Mahony’s gorgeous prairie house renderings than to today’s fly-through CGI graphics. We may think of the 1970s as modern, but it is startling to realize that the pinnacle of high-craft presentation media then was the color Xerox machine, a medium used in many of these presentations. Imagine what a drag on creativity such a limitation would seem today—but look at what they coaxed out of it! These buildings and ideas stand up. They are tied to L.A. They drew on its identity. And then they took the city in yet another new direction. 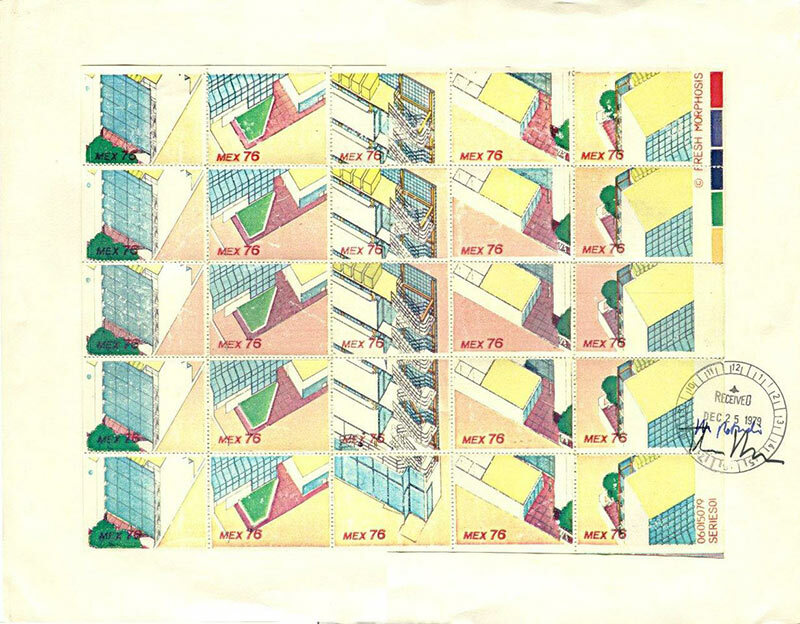 Left to right: Twelve Houses at Cabo Bello, 1976, Roland Coate Jr.; South Side Settlement, 1975-80, Studio Works; Reidel Medical Building, 1976, Morphosis Architects. 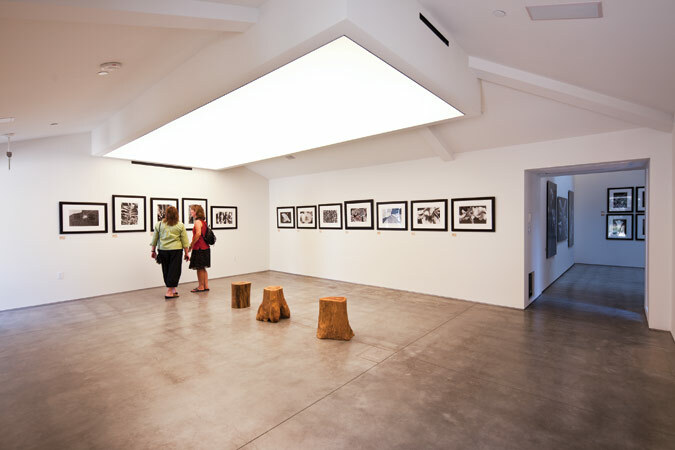 In 1979, Thom Mayne opened a temporary gallery in his home, the first dedicated architecture gallery in the Los Angeles area. Each week, Mayne showcased young and established LA firms, garnering reviews by the Los Angeles Times architecture critic, John Dreyfuss. 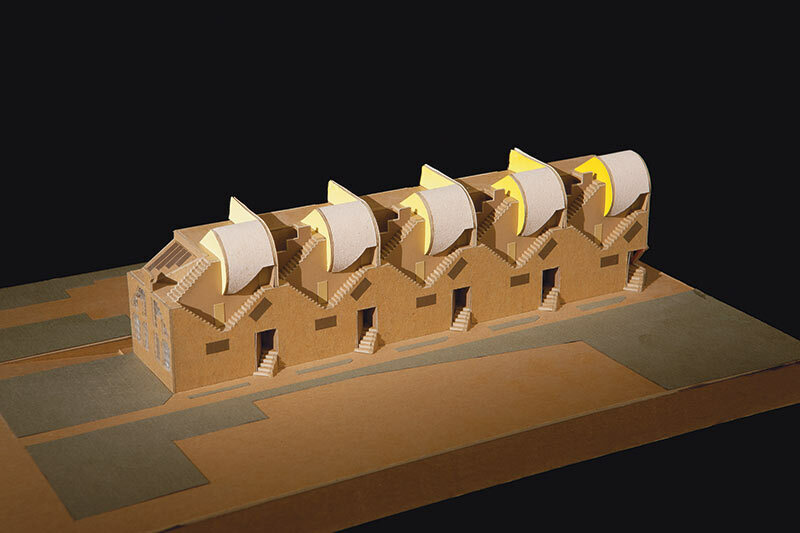 The gallery and its influence are the subject of a new exhibition at SCI-Arc, A Confederacy of Heretics: The Architecture Gallery, Venice, 1979, which is part of the series of Pacific Standard Time exhibitions initiated by the Getty. The heretics turned out to be some of the leading architects of the 1980s to the present, including Mayne and his then-partner Michael Rotondi, Frank Gehry, Craig Hodgetts, Frederick Fisher, and Eric Owen Moss. While architects in the East and in Chicago were puzzling over the in-jokes of postmodern historicism, these West Coast radicals were redefining architectural form and practice in ways that remain bracingly contemporary. Curated by Todd Gannon with exhibition design by Andrew Zago, A Confederacy of Heretics is on view through July 7 at 350 Merrick Street, Los Angeles. LA Mayor Antonio Villaraigosa's "Vision Team," a group of eight architects consulting on the city's planned football stadium and convention center expansion have issued a damning report on the latter project, reports the LA Daily News. 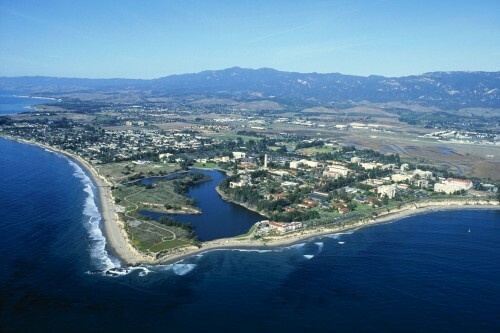 The center is being designed by Populous and developed by AEG. 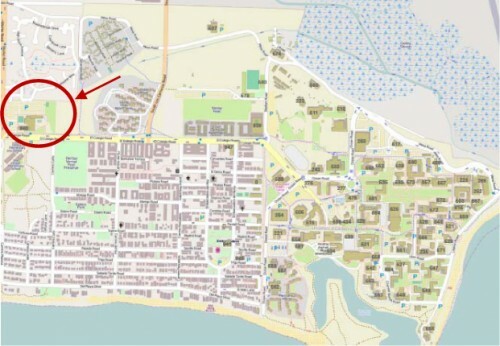 "This is not good city design," Norman Millar, dean of Woodbury University School of Architecture, and a Vision Team member, told the Daily News this week. 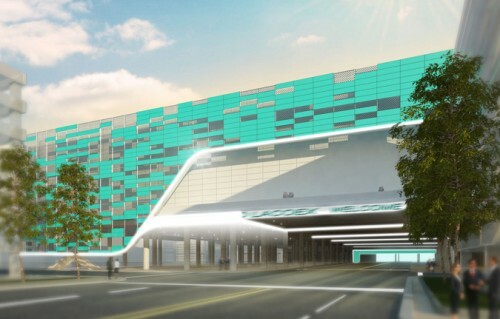 Among the team's complaints, they worry about having visitors enter the new hall through a dark passage created by bridging the building over Pico Boulevard. 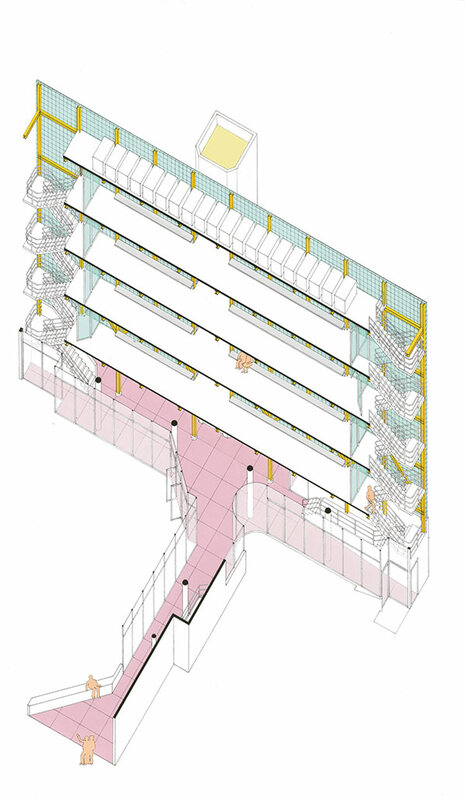 The team also frets about possible fumes under the tunnel, the configuration of the center's huge ballroom, and the amount of natural light that would enter the building. The Vision Team also includes Hitoshi Abe, chairman of Architecture & Urban Design at UCLA; Scott Johnson of Johnson Fain; Joseph Coriaty, a partner at Frederick Fisher and Partner; and Paul Danna, principal at SOM. The group has met at least three times. Villaraigosa's spokesman Peter Sanders told the Daily News that the mayor knew about the Vision Team's concerns. "We believe we have the best plan given the constraints that exist," Sanders wrote. The project's EIR goes before LA City Council tomorrow. 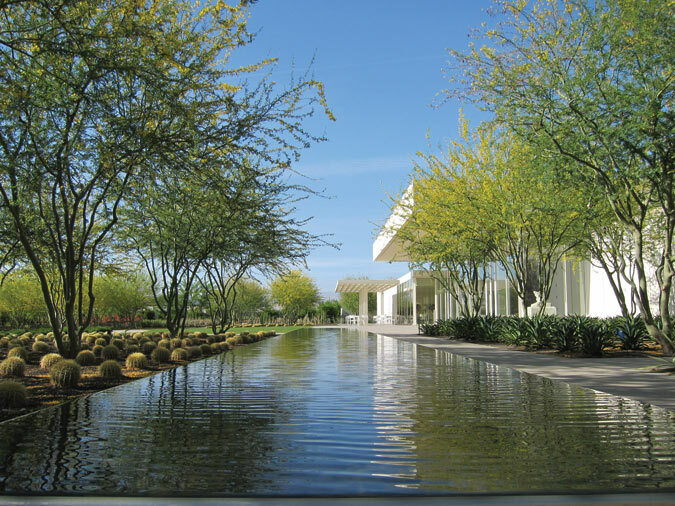 James Burnett's desert landscaping and oasis-like water features harmonize seamlessly with Frederick Fisher's new visitors center. Sunnylands, the 200-acre estate outside Palm Springs commissioned by Ambassador and Mrs. Walter Annenberg and completed in 1966 by A. Quincy Jones, opened to the public on March 1. The house restoration and new visitors center, both by Frederick Fisher and Partners, will serve primarily as a high-level retreat. (Think modernist Camp David in the California desert, plus private golf course.) Fisher’s addition actually fulfills the spirit of modernism better than the original house. Architect A. Quincy Jones, the original Sunnylands architect, best known for his Eichler tract homes, was not doctrinaire in his aesthetic approach, nor obsessed with the ways of concrete or steel. He was, however, keenly interested in crafting joyful spaces using innovative materials, if it served the user and the client. A seminal project for Jones was the 1949 Brody house in Holmby Hills. The Brodys’ decorator, Billy Haines, suggested Jones to the Annenbergs for a new home in Rancho Mirage, about 20 minutes southeast of Palm Springs. Responding to the Annenbergs’ interest in Mayan forms, Jones’ final design features a pyramidal form over the main living area. The skylight on top illuminates a Rodin sculpture placed on a rotating base set in a fountain surrounded by bromeliads. The kitchen, dressing rooms, offices, and master bedroom extend outward from this arrangement. The 20,000-square-foot house, with only one bedroom for the owners, focuses on the universal space for a very high-powered couple. (Most famously, this area was transformed for New Year’s Eve galas, which President and Mrs. Reagan and other luminaries attended.) There are long, lava-stone walls, an unusual background for a staggering collection of impressionist and postimpressionist paintings. But even Jones’ bold moves were challenged by Mrs. Annenberg’s color, furniture, and decorative preferences. When Mrs. Annenberg saw Jones’ red steel columns with punched holes holding up the concrete roof, she had the vertical members painted celadon and the holes plugged with wood dowels. Decorators Billy Haines and Ted Graber (later the Reagan White House decorator) developed the style, which combined English, Chinese, and other influences. The floor in the main area is mostly pink marble. Much of the home’s exterior is also pink, inspired by Mrs. Annenberg’s love of the pale desert light. This is Hearst Castle for the jet set. Thanks to the design team’s skill, the simple forms and grand décor reach a kind of détente. This was one of the advantages of Jones’s modernism. It could almost handle extreme Hollywood Regency. Left to right: Fisher's minimal addition hugs the landscape; fisher's light touch has renewed the original house, with its eclectic furnishings and mid-century sensibilities. Fisher, who has worked repeatedly for the Annenberg family, clearly understands the Jones oeuvre, completing infrastructural improvements with an invisible and sure hand. At the visitors center he accomplished what Jones could not at the main house: a humble, light-filled structure with a strong roof that focuses on the landscape. In this desert climate, it is important not only to see the distant mountains but also to feel sheltered from the heat. 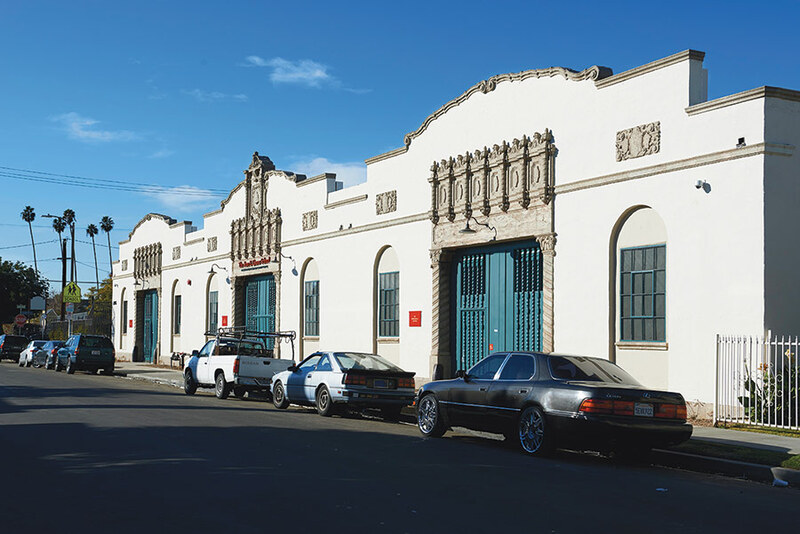 The off-white center houses meeting, exhibit, educational, café, and retail spaces. As at the main house, many of these spaces are flexible. Visitors can always see daylight and follow the path to the garden. The famous lava stone, cut in slightly larger dimensions, covers the two walls in the main public space. The palette, however, is more subdued. The building doesn’t feel nostalgic; rather it is respectful to the Jones legacy, while being contemporary. James Burnett’s stunning new landscape design, featuring a wide range of desert plants, was inspired by Annenberg’s legendary painting collection. Fisher’s subtle work, meanwhile, points to the enduring power of humble modernism—something A. Quincy Jones almost accomplished 45 years ago. AN is headed out to California for the third year running for one of our favorite architecture events: Palm Springs Modernism Week (February 16-26). Palm Springs--and its surrounding towns, spas and arid California landscape--is home to what the organizers call "desert modernism." The city is an extraordinary gridded landscape of modern car-ported flat-roofed houses and dozens of iconic homes, shops, and landscapes. 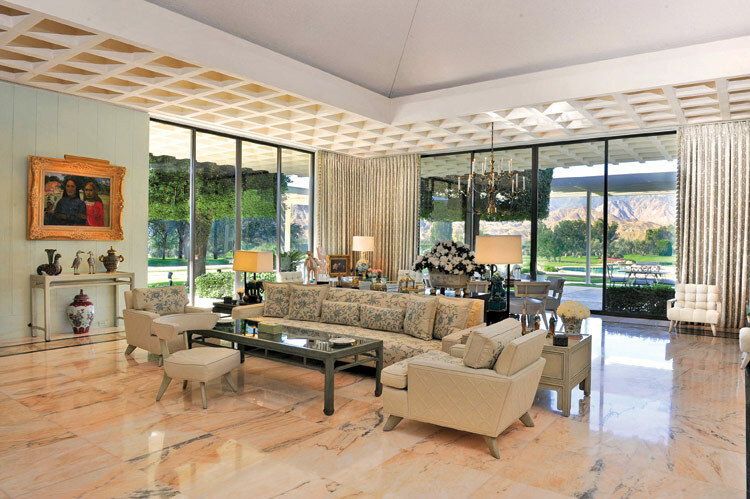 The 11-day celebration focuses every year on an outstanding example of residential modern architecture, and this year it will highlight Sunnylands, the A. Quincy Jones-designed mansion (interior by William Haines) for the Annenbergs in nearby Rancho Mirage. The estate is surrounded by an art garden, labyrinth, private nine-hole golf course (currently being restored), and a new visitors center designed by Frederick Fisher. 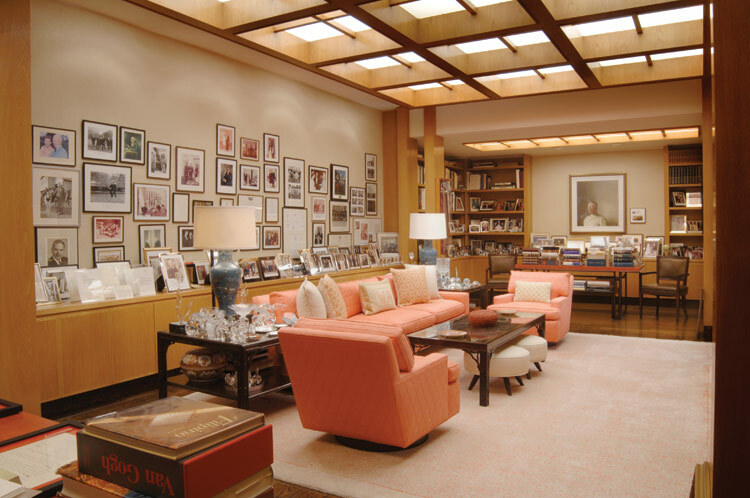 Other highlights of this year's celebration are tours of modern banks, an architecture film series, and visits to the Albert Frey and Raymond Loewy houses. Since this is southern California there will also be an exhibit of Loewy-designed Avantis from the 1960s and a new Airstream trailer designed by architect Christopher Deam. We will report back next week about these and other Modernism week highlights, as well as the new Sagauro Hotel (designed by New York architects Stamberg Aferiat) where we are hanging our hat for the week.